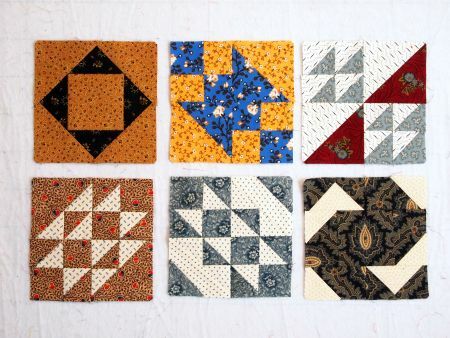 You know how you see a new Block of the Month project and think "Oh, it's only one block per month. I can do that." 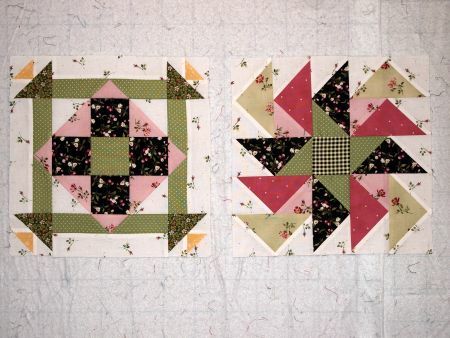 The Twisted Amish, 3D Sampler and Patchwork Party projects are one, two and three years old respectively. 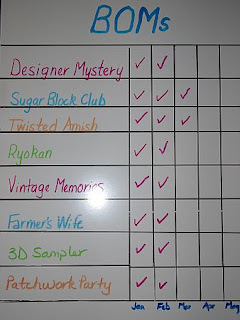 I've been working on the Farmer's Wife for three years -- but now that Marti Michell has written a conversion chart for the blocks to use her templates, it is going much faster. 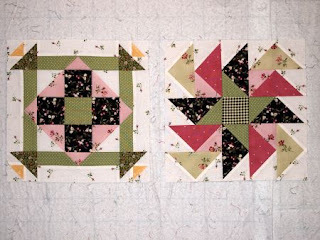 The Patchwork Party BOM also uses Marti Michell's templates. I love her technique, the pieces fit together like a dream! I'm so glad I went ahead and pieced all the setting blocks. Two more months and this one will be ready to put together and quilt! The newest in my BOM gallery is "Vintage Memories," using a gorgeous new collection by Marcus Brothers, "Gallery in Red and Blue" by Faye Burgos. 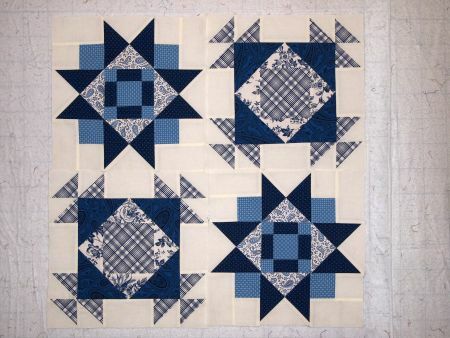 I'm not a "blue" fan, but I had just finished a red and white quilt, so I decided to go with the blue colorway. 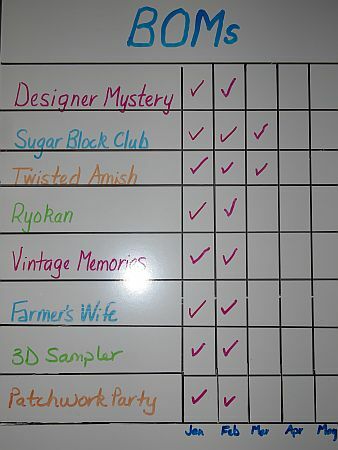 I'm hoping that having the list right there next to my cutting table will encourage me to keep up with all these BOM projects this year! For additional accountability, I'm linking up to Sinta's BOM Rehab at Pink Pincushion. Only two more days to get your February UFO photos in for the parade! You've really embraced the BOM thing there haven't you! No wonder you need the whiteboard. I know a couple of people who have finished the Farmer's Wife quilt and it seems that you have to just keep chipping away at it. One of them is doing the Nearly Insane quilt and having seen the size of the pieces in some of the blocks I can see where the name comes from! Wow! You are awesome! I love your blocks and love seeing all that you have gotten accomplished! You go girl! Ryokan is still my favourite...its tough when it's such a short month to get it all done isn't it? but you sure are making great progress. Wonderful BOM's you are working on! Great job and so nice to find your blog through Sinta's. Very nice, Marti! I especially love the block you made with some Bonnie and Camille prints. So pretty! This cracked me up...I feel like I have that many going too! Hi, I have a question for you. I have the Farmer's Wife book and a tub of fabric for it, but I haven't started sewing yet. Do you recommend buying the Marti Michell templates? They seem like a lot of money for one quilt. I have never used templates and don't know how they work. Thanks. Marti's template sets are a wonderful investment. Every piecing pattern I start, from magazines, BOM's, even mystery quilts, I convert the instructions to use her templates. 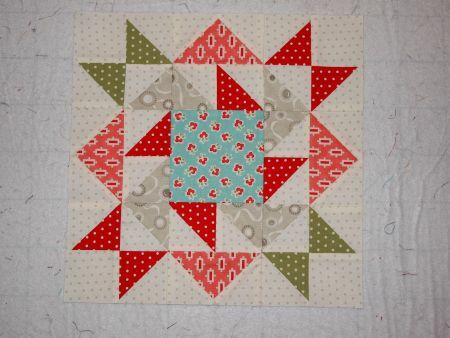 My first project was a drunkard's path king size bed quilt,and I was hooked. Flying geese, and all points match perfectly. Her instruction inserts and books are easy to understand. 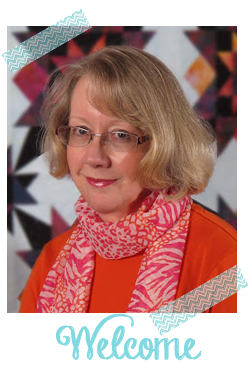 I have been quilting for 15 years and find her rulers and templates to be the best on the market. Enjoy! You have made so much progress - well done! I love that you've made a huge visible chart for yourself. This would work well for me too! 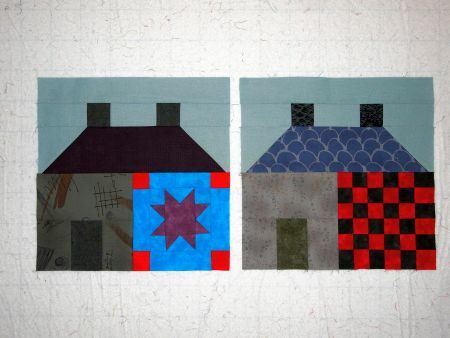 Do the Marti Mitchell templates/rulers fit all blocks that use their shapes, or are they just made for specific quilts? 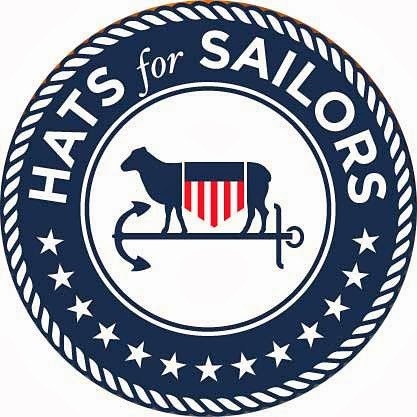 I'm wondering if it's worth investing in such things for quilts I make that include a lot of hst or square in square or flying geese. The twisted Amish is my next UFO!